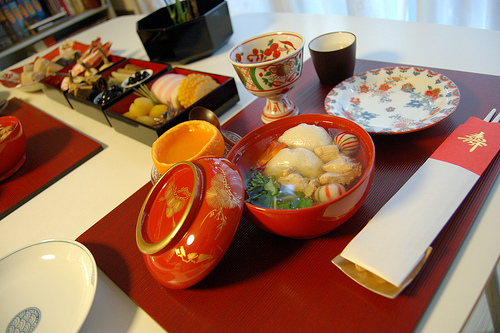 Zoni is an essential food for Japanese new year. But more importantly, you wouldn’t be happy to start new year without osechi ryori, the nicely boxed traditional new year food. So, following the nengajo topic, I am going to introduce another new year prep-related topic, which is about osechi ryori. Some families prepare homemade osechi food with a traditional cooking method handed down from their grandmother, and some families enjoy one sold by department stores or famous luxury restaurant so that ladies can find little bit of relaxing time in the year end without preparing awful lot of food for whole family. For those who enjoy osechi from stores, department stores and convenience stores are now in their busiest time, having their booking closing date several days ahead. 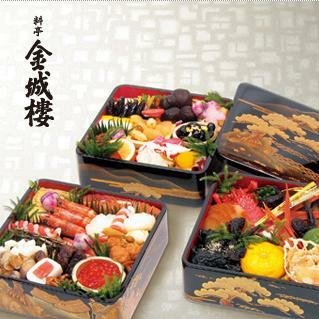 According to the article, quite a lot of very luxury-looking osechi ryori have been appealing to consumers this year. A department store in Tokyo has been taking orders for osechi from the middle of October, and sold all their 0.1 million yen osechi, (equivalent to US$ 1,290) produced by one of well-known, luxury Japanese restaurant, on the very first day. These 0.525 million osechi in 3-tiered boxes have wide variety of speciality food of Kaga and Noto region (Places to See in Kaga and Noto HP) including Noto matsutake mashroom, fugu no kasuzuke (pickled blowfish), higuchiko, which is a dried ovary of sea cucumber, konowata (salted entrails of trepang), yubeshi (Japanese sweets with citrus) and so on. So, here is the image of the most expensive osechi, sold out! Wow, look at them! Beautiful presentation with colourful food is just like art when it comes with these gorgeous lacquer wares～. Now, is there any essential food for new year’s day in your local area? If so, please let us know～♪ I’ll be looking forward to hearing from you.